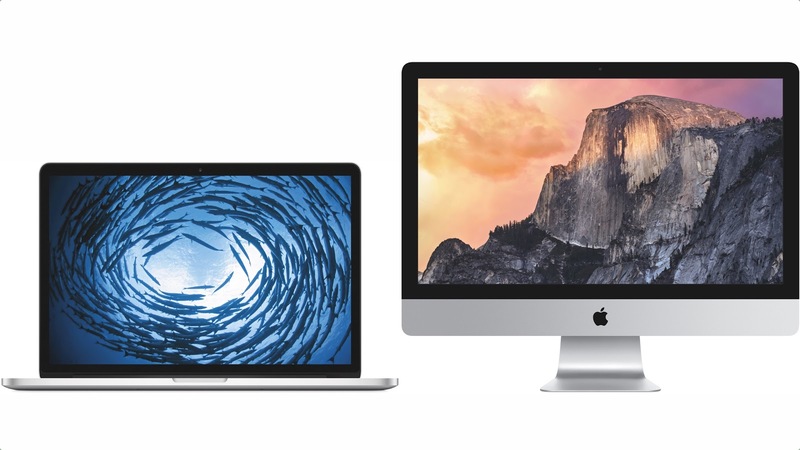 Apple today updated two of its top of the line Macs, the 5k iMac and 15" MacBook Pro with Retina Display. Both are relatively minor refreshes that tweak the already existing lines. The new iMac, which was launched in its 12" 5k incarnation last fall, comes in a much more affordable price. The initial model debuted at $2499 and today a new lower end version with a 3.3ghz Quad Core i5 CPU can be had at $500 less at $1999. It also comes with 8GB of memory and a 1TB hard drive as well the Radeon R9 M290 graphics. The original top of the line model receives a $200 price drop to $2299. That features a 3.5ghz Quad Core i5 CPU and R9 M290X graphics. If you were looking for other changes like USB Type-C, you'll have to wait for the next generation. The 21.5" which was last refreshed in June of 2014 and Non-5K 27" iMac last touched in September of 2013 were not updated along with the 5k models. The 15" Retina MacBook Pro was also updated with some of the features found on the new MacBook and updated 13" model. The updated machines feature the new Force Touch trackpad, faster PCI-E x4 SSD drives, and new Radeon R9 M370X graphics chip in the higher end model. The battery has been tweaked to be slightly larger. This has the side effect of bumping the battery life from 8 hours to 9 hours. What does not change are the CPUs. While the new 13" has 5th generation dual core Broadwell chips, the 15" retains 4th generation Quad Cores at 2.2, 2.5ghz, and 2.8ghz. These are the exact same chips as the 15" updates launched 10 months ago. Apple isn't alone. Intel hasn't shipped 5th generation Quad Cores to anyone yet. Since the Intel graphics are on-die, it also retains the Iris 5200 Pro integrated graphics. General configurations and the $1999 and $2499 price points remained unchanged from last year.